The Foodservice and Concessions industry is one of the largest employers in the United States. Over 800,000 work as servers and managers alone. Employers for foodservice workers are not limited to restaurants. Hospital cafeterias, airports and coffee shops are just some of the non-restaurant employers of foodservice workers. Foodservice workers perform a variety of customer service, food preparation, and cleaning functions in an array of settings including: full-service restaurants, casual dining eateries, hotels, and at airport concessions stands and eateries. Most are part time employees and are often expected to work early mornings, late evenings and holidays. Jobs in foodservice include: server, host/hostess, cook, and cashier. 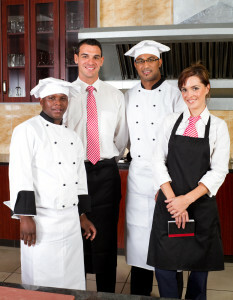 Many foodservice jobs are entry level and do not require a high school diploma. To download foodservice resume templates and samples, click here.